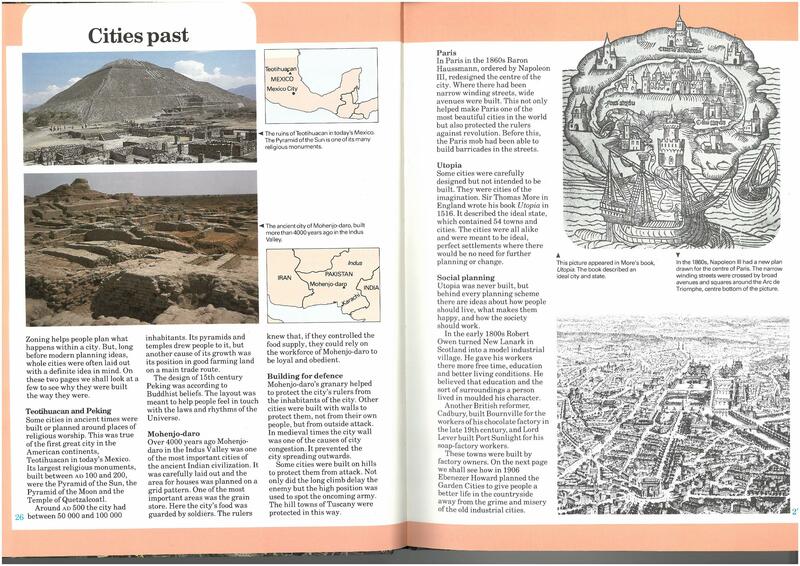 This is part 3 of a 6-part series covering “Cities in the Year 2000”, a kids’ book on cities published in 1985. Here are parts 1, 2, 3, 4, 5 and 6. I suggest reading on a desktop, as the screenshots of the pages should be large enough to read (hopefully). 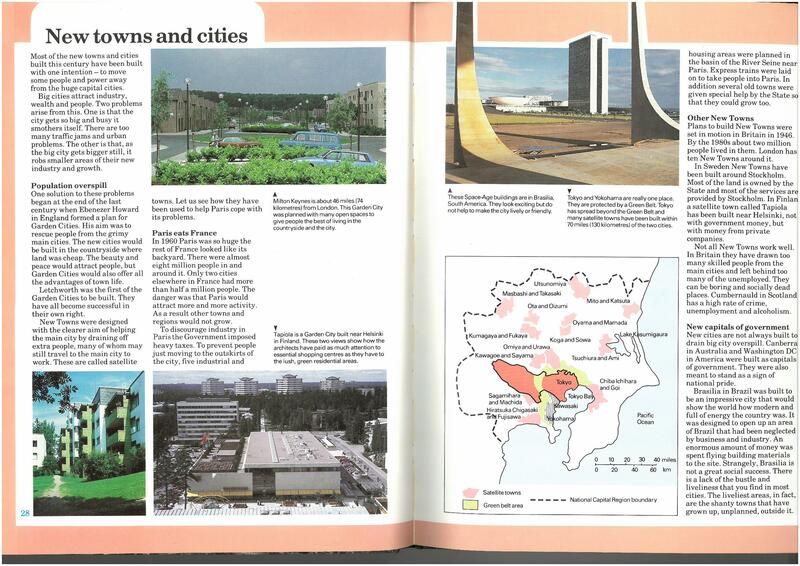 This page talks about some considerations for city planning: ensuring light and clean air, open space etc. I give it bonus points for using the word “higgledy-piggledy”. Historically, cities weren’t planned at all, and in the early stages of the Industrial Revolution factories and mills were mixed in with housing: “the result was a city almost impossible to live in because so much of it was grimy and unhealthy”. 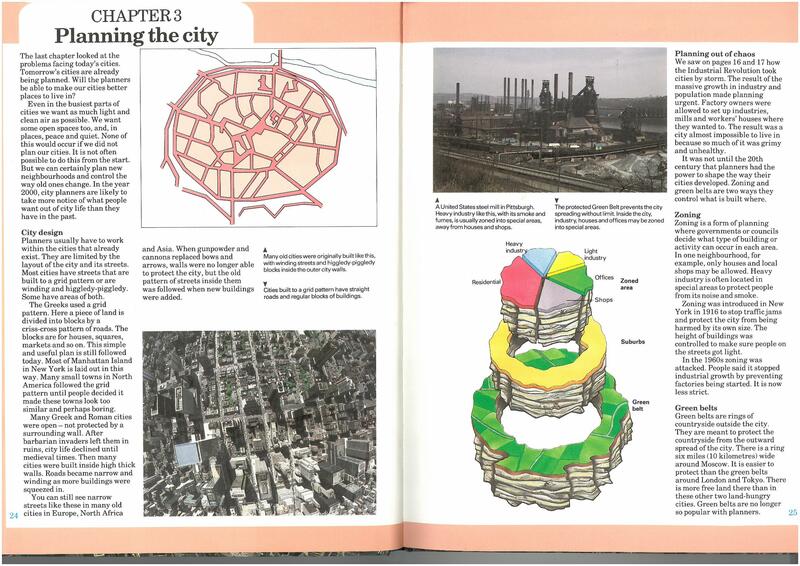 In the 20th century, cities started to plan how they would structure themselves. Zoning and green belts are two methods mentioned, although “green belts are no longer so popular with planners”. Certainly in NZ, all the green belts I can think of were set up many decades ago, many of the cities involved have grown beyond them, and urban limits are now the preferred method of controlling city boundaries. Zoning, of course, is pretty much universal in NZ; industry is separated from housing. We’ve had much some in-depth discussions about it on this blog [LINK]. Now we see some of the ‘new’ (20th century) cities – typically those which were deliberately “built with one intention – to move some people and power away from the huge capital cities”. Various world governments have been keen on this idea; the book notes that “two problems arise from [the attraction of big cities]. One is that the city gets so big and busy it smothers itself… the other is that… it robs smaller areas of their new industry and growth”. Generally, we’re talking about governments making a value judgment that growth should be spread around the country, and taking steps to make that happen. There’s quite a history of this, as laid out on the page. From the ‘garden cities’ and ‘new towns’ of England, to heavy taxes imposed on Paris to encourage businesses to go elsewhere (with new towns planned along the Seine, connected to Paris by high speed rail), to Brasilia in Brazil and Canberra in Australia – both introduced as new cities to be their nations’ capitals, and take some activity away from the big existing cities. The book notes that “not all New Towns work well. In Britain they have drawn too many skilled people away from the main cities and left behind too many of the unemployed. They can be boring and socially dead places”. 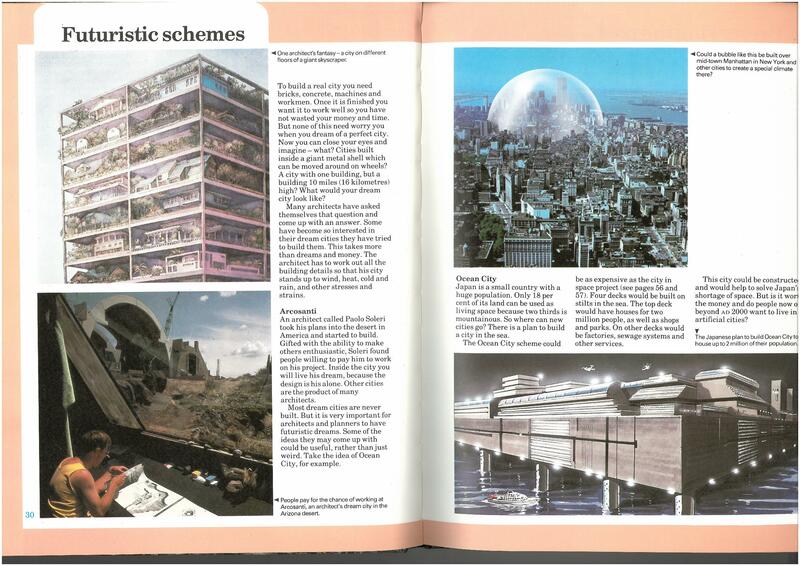 Of course, many ‘futuristic schemes’ for cities have come and gone since this book was published. I’m not sure any have really come to fruition, at least in the developed world. Places like Dubai, or various Chinese cities, might be influenced by a desire to be “futuristic”. This page gives some interesting examples of cities which have tried to preserve their heritage; Venice, which continues to slowly sink into the sea; and Warsaw, largely rebuilt after World War II with some areas “made to look exactly as they did before”. The tradeoffs between preserving heritage and enabling new development are something every city has to grapple with. 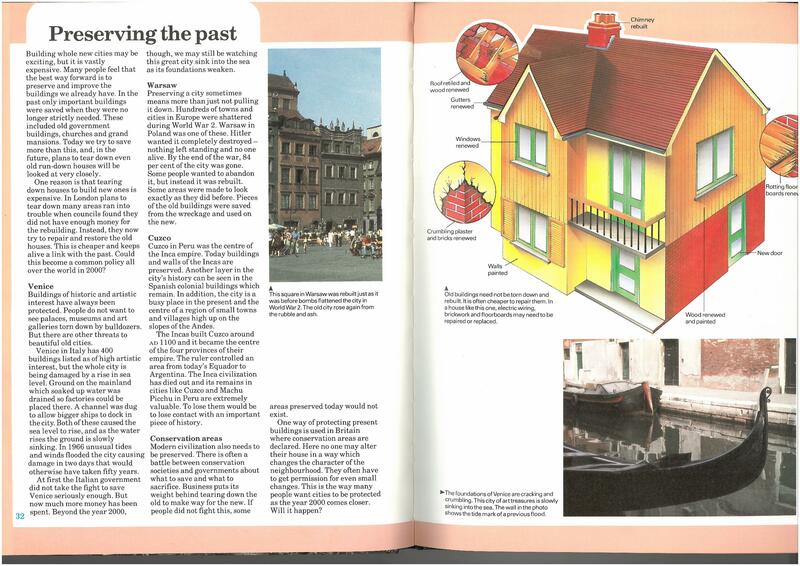 The book also notes, using the example of a house, that it’s often cheaper to repair old buildings than to replace them. More growth happening in smaller towns instead of cities would probably result if we were required to reduce our ecological footprint. Easier to have less impact if you’re using less fuel and infrastructure to move food and materials in, and waste out. Then Governments wouldn’t have to step in with value judgments. Perhaps, but I’m not sure. I don’t think there’s clear evidence that small towns impose lower costs on the environment than big cities (or vice versa for that matter). People in cities tend to have more economic opportunities and higher incomes than people in small towns, and higher incomes can mean more resource use etc. But if you took a city household and also a small town/ rural household with the same level of economic wellbeing/ income etc, I don’t think you could definitively say that one or the other is likely to live more sustainably. And a lot of it would depend on the type of city, e.g. dense or sprawling, good public transport or not, and it might change over time e.g. if working from home becomes more popular or other techy things happen, etc. I’d just say, let’s aim for a more sustainable Auckland. Given that the city dominates NZ population growth let’s try to grow it in a sustainable way (i.e. focus on intensification). And given that there’s a large population already here, and we’re undercooked with public and active transport options, let’s invest in those too! Yes, and I guess that aiming for a more sustainable Auckland requires the same drivers: tax, regulation, etc, to internalise the costs of our activities and to reduce our actual impact. So whether it works to improve Auckland or to improve regional balance, the drivers are what we need to get right. We’ve got a fair way to go. Yup, and a proper carbon tax or beefed up ETS will be a good start! We are a family of four in an apartment in the CBD. I used four tanks of fuel in our car last year. Our power bill, which I will use as a proxy for energy consumption, didn’t exceed $150 in the coldest winter months or the hottest summer months (air conditioning). Groceries are delivered by a van making at least another dozen deliveries. Our extended family, who live in various regional centres, have two cars per household and use in the region of 24 tanks of fuel a year. Their power bills for their stand-alone houses are higher, they also use wood burners, and they are still less warm. Dense living allows walking and cycling, efficient public transport, grocery and other shopping delivery. The average apartment is much more efficient than the average stand-alone house. Other people have done the numbers, but dense urban living can have a much lower environmental impact than regional centres. Thanks Anthony! Wow, at that level of car usage you might be better off ditching it altogether and subscribing to Cityhop? As for me, I’m a family of almost-three in the CBD with one car and think it will stay that way for the foreseeable future, we do use the car a bit so won’t get rid of it, but certainly don’t need a second either! In practice, I think using Cityhop with preschoolers would involve discovering one or the other car seat wouldn’t fit, and even if they did, that the stroller wouldn’t fit at the same time. And the other thing I can’t do with a rental car is get out of town with mountain bikes and kids. You can’t fit bike racks to a rental of any kind. So until there is regional rapid rail with a bike car, I think we’ll have a car for the foreseeable future. Absolutely. Have you read “No Impact Man”? It’s quite good. I think there are many different anecdotes about lifestyle, but inner city and alt-rural probably come up as the best low impact options. Cuba St and Raglan being the two lowest carbon footprint communities from a selection studied, for example, Takapuna being the highest. – the problem of so much area paved over. Yes, you can remove it with sledge hammers and crow bars – the Depave movement has shown us that – but it would be better to avoid such hardship. Etc. I suspect that in the worst of the future energy scenarios that we should be considering as strong possibilities, there simply won’t be enough ecology left within cities to deal with our sewage, our waste, the heat, the need for food. We can design our cities so that there is, and that would make the most livable city anyway, but that’s not what our RLTP or 30-year plan has budgeted for. The problem with our small town is a lack of efficiency high speed rail that connect to the city. Also the density is too low to support mass transit. Efficient mega cities have satalite cities that have good density and connected to city center with mass transit. The high density is made livable using high rise apartments that are not too close to each other, so all units has excellent outlooks views and sunlight. In between building there are well landscaped green spaces and walking/cycling tracks that connect to town centre. There are small local parks, sport field, little shops, kindergartens, primarily schools, and cafes along the way. The centre of the each satellite town is a huge TOD train station with mega shopping malls, supermarket, cinema, library, recreation centre, community facilities, secondary schools, local offices, and restaurants. People can meet most needs in the satellite town, however they can also use high speed train to travel to city for professional jobs, specialized shopping and mega concerts quickly and efficiently. Perhaps it comes down to the details, Kelvin, but are there not more examples where the satellite towns don’t provide the full array of social connection? An example would be children only getting to meet the carers of the people and places in the satellite towns: teachers, swimming pool attendants, gardeners, etc, instead of being able to meet people working at the full set of jobs that a complete city offers. Therefore the children grow up unsatisfied about what life and society means and what their place is in it. Or mothers finding it difficult to do part-time professional work at home because all the firms of their profession are in the main city, and so the possibility of quickly popping to the store with the specialist products needed doesn’t exist, or the chance meeting on the street with someone who has the answers you need doesn’t happen, or they get overlooked to join the group who’ve been offered morning tea to meet the expert passing through unexpectedly. Etc. There are advantage of meeting the same people over and over again. It build a closer community like a small town. In big cities people never meet the same person again and people would feel alienated. For mum who are professionals would better served in living in city center in that regard. We could have spwarl 2.0, where hi-tech homes are prefabricated and airdrop to a remote location like the top of a mountain, or in an island. The homes are off grid – made possible by high efficiency solar panels, water extraction system, and waste recycle system, and a small farm to grow some food. With next generation batteries and high efficiency solar panels, people travel using low cost long range electric flying cars, and Uber unmanned flying taxi. People also buy groceries and products online and delivered using drones. The spwarl is congestion free due to limitless air space and high speed of the flying cars. The centre of city is a huge ‘shopping mall’ with showrooms (to show them products that can be purchased online), restaurants and entertainment park that act as a social space. The shopping mall would be design to feel like a nice virtual town with streets and green spaces.